The Passive House approach uses passive building strategies to create an indoor climate that requires minimal energy to maintain comfortable living conditions. During the design phase, energy modeling software is used to engineer the building enclosure based on regional climate data and optimized solar orientation. The resulting energy model predicts annual energy consumption and operating cost for the building. Testing during construction verifies the building is meeting the requirements for insulation levels, air tightness, and modeled mechanical efficiencies. With some 30,000 to 50,000 buildings built worldwide, this modeled and verified approach to low energy buildings has proven to be very successful in helping to ensure certification. But how do these buildings perform over time? Post occupancy monitoring of energy consumption is critical to ensure the indoor climate conditions are being maintained with minimal resource consumption and to inform our Passive House strategies over time. In 2015 RPA teamed up with Shawn Soeder, one of our Passive House clients, an engineer by training who has experience in information technology, to create the specifications and installation instructions for an Arduino-based Passive House IoT Climate Monitoring and Reporting System. The system is simple. 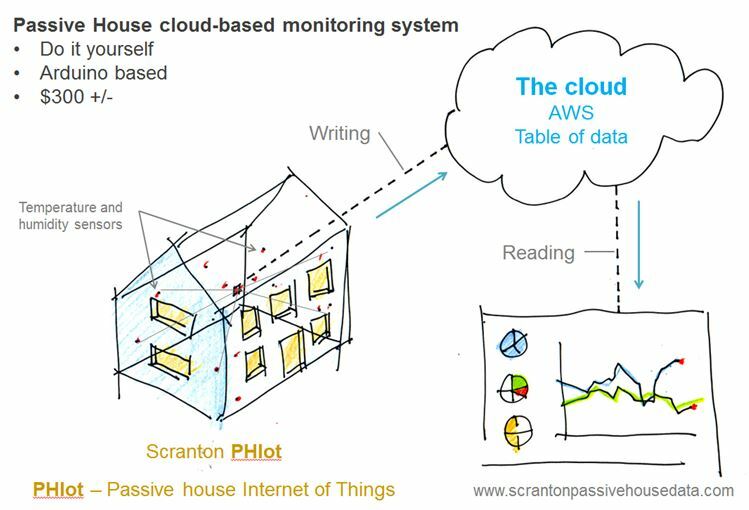 Sensors are placed around the interior and exterior of the house and collected data is transported to the cloud through the home WiFi connection. The data is reported as a table of values. Shawn Soeder has written code to access the table and turn the data into a rudimentary dashboard. This IoT (Internet of Things) model does not require a computer. Each temperature and humidity sensor simply takes intermittent measurements and sends its findings to the cloud. The assembly and installation of sensors is DIY. We are beta testing the system in RPA’s first 3 Passive House projects: the Scranton Passive House, the Keffer Passive House, and the Soeder Passive House. Each of these systems have 16 sensors measuring temperature and humidity in and around the home and 4 sensors on each port of the ERV measuring air flow, temperature, and humidity. The systems use off-the-shelf components costing approximately $300 per home. The system is inherently secure since (1) it is unidirectional in sending data to the cloud and doesn’t receive any data or commands from the Internet; (2) the system uses a microcontroller – and doesn’t use a computer or operating system that could be compromised; and (3) the data sent to the cloud doesn’t include any sensitive or private data. When the pilot is complete and we know the Passive House monitoring system is working well, we will share the specifications and installation instructions with the community so anyone can install an affordable Passive House IoT Climate Monitoring and Reporting System and share their information with the community. While having the monitoring data from RPA’s Passive House projects will be very useful, it will be even more valuable to aggregate the data from all PHIUS certified Passive House projects into a single repository so we can compare information across climate zones furthering the climate adaptive standards. Hi Richard, Great work. Would you consider utilising blockchain for this system? Hi Richard, wondering how this system is working and whether you are willing to share the instructions on how to pull it all together? We have a number of Passive Houses completed, in design and in construction and would like to start monitoring them. Thanks.